Could you be suffering from Text Neck? 24 Oct Could you be suffering from Text Neck? 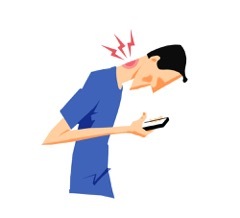 “Text neck” is a coined phrase commonly used by Chiropractors for when we look down at our phones or tablets for long periods of time causing us to put strain on our necks. Did you know that the average human head is roughly the weight of a bowling ball or a pumpkin? The weight actually increases the more your head is put into forward position as it is when we look down at a screen. Imagine then, the pressure that we are putting on our necks when looking down at a phone or any type of screen for long periods of time or even when we just sit with a poor posture. If you hold a pumpkin or a bowling ball in your hands with your arms outstretched in front of you, you will feel your arms getting tired quickly as the muscles are working hard to keep that pumpkin supported. This is exactly what is happening with your neck and shoulder muscles when you put your head forward in the “text neck” position. They can get overworked which can lead to tension, pain and when the function of the neck is eventually impaired with a loss of movement and inaccurate nerve input, it can result in headaches. If you or anyone you know is suffering from headaches, neck or shoulder pain and you know that they spend a lot of time looking at screens, then why not ask them to give us a call as Chiropractic care can help to gently release the tension in the neck, reduce the pressure on the nerves and help keep those headaches at bay.